Should we Pay for a Minor Repair Policy with our New Hyundai i30? — Auto Expert by John Cadogan - save thousands on your next new car! Should we Pay for a Minor Repair Policy with our New Hyundai i30? Hi John, we emailed you recently asking your advice on trading in our Honda Jazz for another small car. You suggested we look at the Hyundai i30. We did exactly that and were so happy with it we purchased one. The only extra we are getting is window tinting at a lower price than they wanted us to pay and we asked them to throw in the car mats. Overall we had a good experience with Suttons at Rosebery and are really looking forward to delivery. The question we had was regarding Schmick. We haven't committed to this with Suttons as we needed to do a bit of research. We were not sure if it was worth the joining fee they were asking. We would love your opinion on this service and if you think its worth thinking about. We ended up not trading in our Jazz instead selling it to a family member. Thanks for your assistance we really appreciated your guidance. What is Schmick offering and what is the price? JC. Hi John, through the dealership the deal with schmick was, joining fee for 2 years $395, all scratches, minor dents etc repaired for $50.00 with no limit. We have never heard of the service before and we were interested in your opinion. We are being careful because this purchase it a big one for us as I have just been retrenched after reaching the dreaded 60. We have visited their website, it looks interesting but we are a bit paranoid about being ripped off. Thanks John, we really enjoy your show on Radio 2UE , always informative and entertaining. Hi Linda, thank you very much for the kind words. I appreciate the purchase is a big one, in the circumstances. The maximum risk is for Schmick $395 if things don’t work out - and I’m pretty sure they will do as advertised. If you use them once a year then the service will have paid for itself, compared with the cost of a panelbeater. I don’t think Schmick (nor its competitors) is a rip-off, but whether or not the minor repair policy represents good value is something only you can decide. 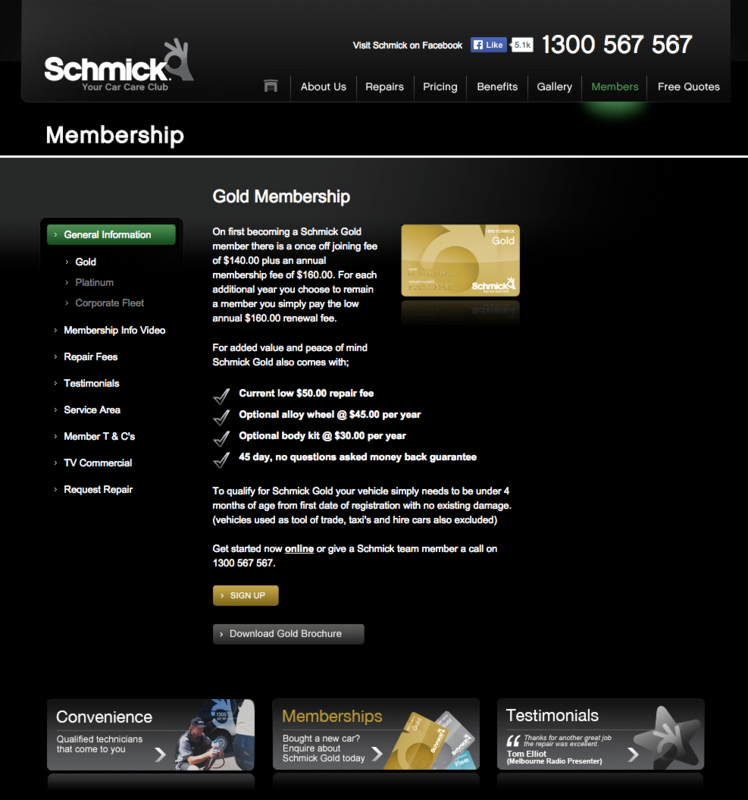 Having looked at the company's website, you can purchase a 'Gold' membership policy independently and save $95 - and it entitles you to all the benefits you just described, for $95 less. (Joining fee $140, annual fee $160 - currently two years for the price of one. Ie - second year free. At least that's what the company's television commercial on this page >> says.) Typical of dealerships, they've just re-branded the service and marked it up almost $100 - a good deal for them for shuffling a few extra forms around, but probably not the best way for you to acquire a Schmick policy. Just go to their website direct and sign up. Cut the dealer out. Should I Buy a Hyundai Santa Fe or a Nissan Pathfinder?